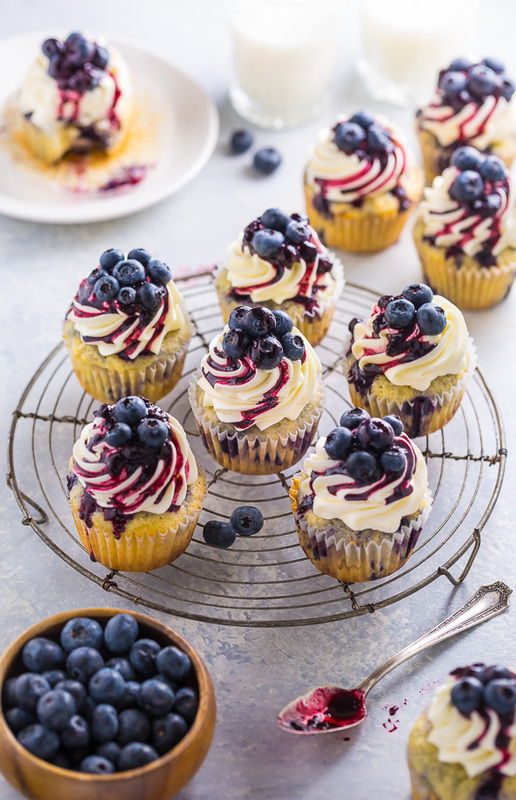 Stunning and delicious, these White Chocolate Blueberry Cupcakes are a must bake for blueberry lovers! I’m curious: Do you have a favorite berry? I honestly love them all, but if I had to pick, I think it would be blueberries. Especially for baking! They can easily be incorporated into a variety of recipes (hello pancakes, muffins, and pie) and I love how sweet and juicy they become after a quick stint in the oven. One of my Summer goals – in addition to baking blueberry everything – is to bulk up the white chocolate section on this website. That means you’re going to be seeing a lot more luscious white chocolate recipes around here! I’m thinking white chocolate raspberry fudge, white chocolate lemon brownies, and of course: White chocolate and blueberry cupcakes! One of the (many) things I love about this recipe is that it isn’t overwhelmingly lemony. Don’t get me wrong – I love lemon and blueberry as much as the next gal. But I really wanted the white chocolate to shine here, so I was very conservative with the lemon, adding just a teaspoon of zest in the cupcake batter. I find this amount perfectly highlights the blueberries without overpowering the delicate white chocolate flavor. Upon first bite, you’ll know what I mean. It’s the perfect marriage of flavors! Because we want the moistest cupcakes possible, this recipe calls for cake flour. Cake flour is extra finely ground and gives the cupcakes their extra soft texture. In most grocery stores, you’ll probably find cake flour in the baking aisle. You can also buy it online here. You must toss the blueberries in flour before adding them to the batter. 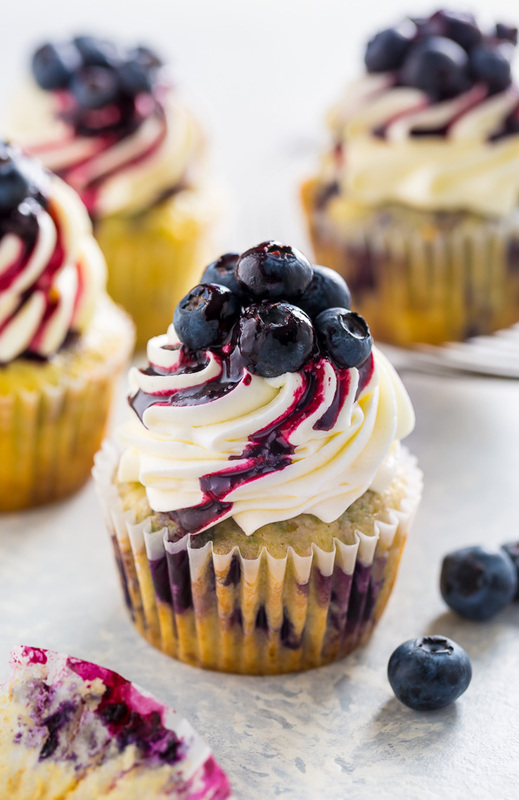 This dusting of flour helps keep the berries afloat during the baking process, and ensure you won’t bite into a cupcake full of sunken berries. Feel free to use fresh or frozen berries for this recipe. If you use frozen, don’t thaw them first. I don’t recommend using wild blueberries, which are much smaller than traditional blueberries. Before you begin baking, make sure your butter, eggs, sour cream, and milk have all come to room temperature. Cold ingredients do not bond! When you measure your cake flour, be sure you’re not packing it into the measuring cup. Packed flour will yield dense and dry cupcakes. You’ll also want to use quality white chocolate, such as Lindt, Baker’s, or Ghiradelli. I don’t suggest melting white chocolate chips. Be sure to cool the white chocolate for at least 10 minutes before adding it to the frosting. It should be completely melted, but cool to the touch. You’ll need a fine-mesh strainer to make the blueberry drizzle. You’ll place the strainer over a small bowl and push the puree though. You’re only going to use the liquid in the bowl. You should have about 1/4 cup of liquid in your bowl. Discard any skins/seeds left in the strainer. 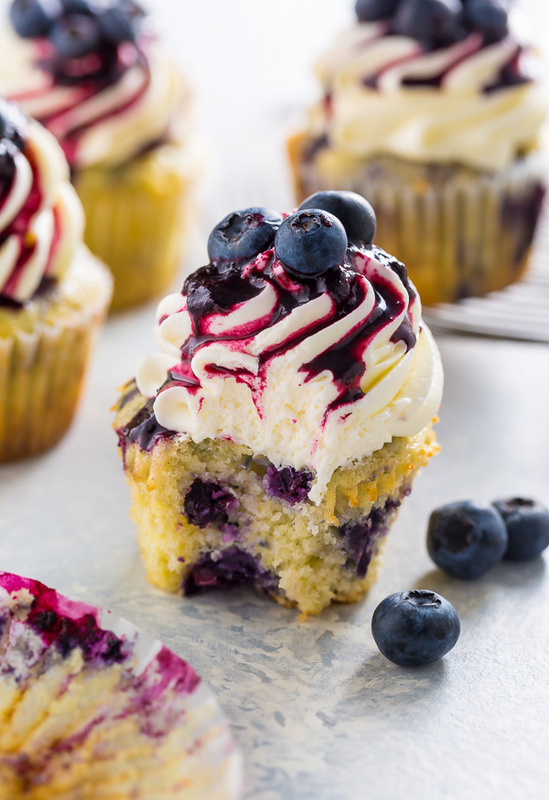 Please make sure your blueberry drizzle is completely cool before topping the frosted cupcakes. If the drizzle is even a little warm when you add it to the cupcakes, the frosting could melt. The puree typically takes 15 to 20 minutes to cool. Moist and fluffy Blueberry Cupcakes topped with creamy White Chocolate Frosting! This recipe is easy, delicious, and beautiful. In the bowl of a stand mixer fitted with the paddle attachment, or in a large bowl using a handheld electric mixer, beat the butter, vanilla, sugar, and lemon zest on medium speed until light and fluffy, about 2 minutes. On low speed, beat in the sour cream, then the milk. Turn mixer off. Add in 3 and 1/4 cups of the cake flour, baking powder, baking soda, and salt. Use a fork to lightly toss the dry ingredients together. Using a rubber spatula, gently fold the dry ingredients into the batter, mixing just until combined. Be sure not to over mix here or your cupcakes will be dense! Set aside. In a small bowl combine the blueberries with the remaining cake flour and toss to coat. Gently fold the blueberries into the batter, stirring just until combined. Spoon batter into prepared cupcake tins (filling each mold 3/4 of the way - not more or they'll overflow). Bake one pan at a time, for 18-21 minutes, or until a cupcake tester inserted in the center of a cupcake comes out clean, or with just a few moist crumbs attached. Cool completely before frosting. In a stand mixer fitted with the paddle attachment, or in a large bowl using a handheld electric mixer, beat the butter on medium-speed until completely smooth. Reduce the mixer speed to low and gradually add the confectioners sugar, no more than a 1/2 cup at a time. Once all of the sugar has been incorporated, add in the salt, sour cream and milk. Add in the white chocolate and beat smooth. Once all of the ingredients have been incorporated, increase the speed to medium-high and beat for a full minute. This step helps the frosting get nice and fluffy. If the frosting appears too thin, add a little confectioners' sugar, one tablespoon at a time; if the frosting appears too thick, add a little more milk, one tablespoon at time. In a small saucepan combine the blueberries and the lemon juice; bring to a simmer over medium heat and cook, stirring constantly and gently smashing the blueberries smooth, until thickened into a deep, dark blueberry reduction, about 12 minutes. Remove from heat. Place a fine-mesh strainer over a small bowl and push the puree though, leaving any skin/large chunks behind. Allow mixture to cool completely before using. Pipe or spread frosting on top of cooled cupcakes. Drizzle with a teaspoon of blueberry sauce, then top with a few fresh blueberries, if desired. I had a visual of blueberry pancakes on my blog but the person who posted closed down his blog & the picture went away. I must say I was happy to repost your lucuous looking dessert on my blog. 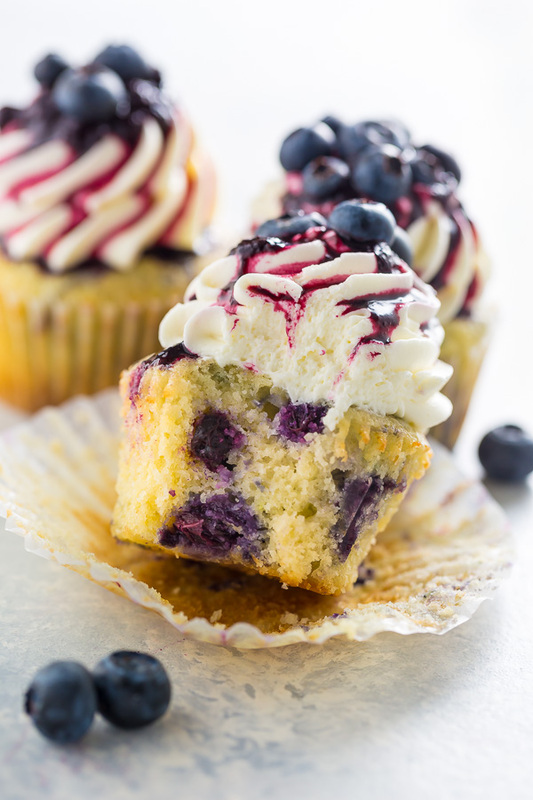 I didn’t grow up eating blueberries but when I discovered them via muffins, I had been missing something special. Right next to a banana they are unique a special flavor in desserts. I actually know & get along with two people who dislike blueberries & bananas. Go figure. Oh my these Cupcakes are Beautiful! Our 3 girls and their families will be here for our (3 day) traditional 4th of July get together and Birthday celebration for our middle daughter. We have a barbecue of course, but this years “Star dessert” will feature your Blueberry Cupcakes and I can’t wait! Thank You so much for sharing. Thank you so much, Darlene! And your 4th of July celebration sounds amazing 🙂 I can’t wait to hear how the cupcakes turn out! I love your recipes but sometimes it is difficult to convert them to metric, I don’t mean to be cheeky but it’s not just the USA that sees your website. We use metric or imperial but not cups. Please can you help. Hi Teresa. I find this guide really helpful when converting recipes http://www.kingarthurflour.com/professional/conversions.html I hope that helps! Love the Cupcakes and the cute cupcake baker pan…Where did you find that ??? I’m confused about the amount of butter. One stick of butter is 8 ounces. Hi Donna. I just double checked – the sticks of butter we use are 4 ounces each. I hope that helps! These cupcakes are delicious, went down a storm with everybody. I halved the ingredients and made 12 just in case as it was my 1st attempt but no need to worry, they turned out perfect – just like the photos. I will be making more of these for a coffee morning we have next month. Thank you. Hello. Where is the post for melting the white chocolate please? Ooo made these today with my 19 month old. She loved the blueberries and was eating them while we were baking lol. They are really nice! Will definitely be pinning this in my faves to make again! I’m in the UK but managed to convert the measurements easy enough. Plus I invested in some cup measurements for recipes just like this 🙂 thank you for sharing. I’ve been testing out cupcake recipes for my daughters first birthday and these are amazing! 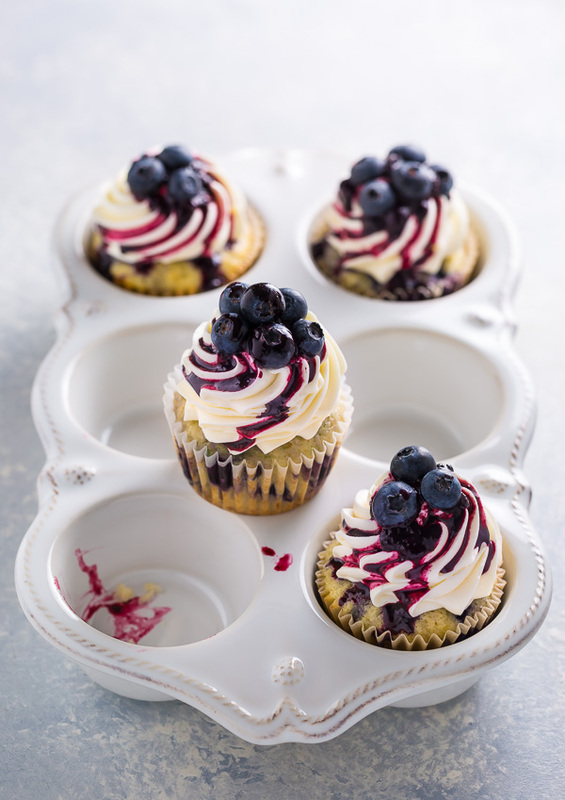 The white chocolate frosting goes perfect with the blueberries! What tip did you use for the frosting, please? ?